Hurricane Sandy pushed into view echelons of working-class New Yorkers normally hidden behind workplace walls or in obscure neighborhoods, or made invisible by familiarity and indifference. There, suddenly center stage, was the old, heavily Catholic, white working class. Some of the most devastated parts of the city, like Breezy Point and Gerritsen Beach, seemed frozen in time, neighborhoods of Irish- and Italian-American policemen, firefighters, blue-collar workers and politicians, still reflecting a New York dominated by European immigrants and their children. As on 9/11, heroic rescue efforts by the Fire Department exposed how white and male it has remained, even as the city’s population has become ever more diverse. Newer immigrants, too, were thrust into the spotlight, like Philippines-born Menchu de Luna Sanchez, one of the nurses who carried sick infants down pitch-black stairways when flooding forced the evacuation of New York University’s Langone Medical Center. President Obama hailed her in his State of the Union address. Even much poorer New Yorkers received attention, like the thousands of public housing residents stranded for days and sometimes weeks in high-rise buildings without power, heat, water or elevator service. On the Upper East Side of Manhattan, undamaged by the storm, well-heeled dads and moms found themselves in the unaccustomed position of trying to amuse their housebound children for hours on end, as the low-paid, immigrant child-minders who pour into wealthy neighborhoods each morning were themselves trapped at home. New York, at least numerically, has long been a working-class city. Today, there are far fewer manufacturing workers than a generation or two ago and many more service workers, far fewer immigrants from Europe and many more from Asia and Central America. But perhaps the biggest change is that workers and their families are less socially visible than in the past, except when disaster hits or conflicts break out—like Sandy or the school bus drivers’ strike earlier this year. Increasingly, the image of the city as the home to great wealth or layabout hipsters (sometimes, as on Girls, living off their parents’ bank accounts) has camouflaged the struggle of middle- and lower-income New Yorkers simply to get by. At first glance, workers in New York, compared with most of the country, are doing well. At the start of last year, nationally only a third of the jobs lost to the Great Recession had been regained, but New York City had already bounced back to its pre-recession employment level. In December 2012, the city had more than 3.9 million jobs, the most ever. And more of those jobs were unionized than almost anywhere else. 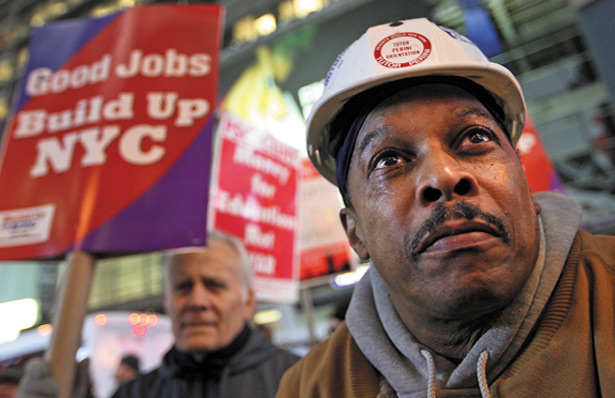 A recent report by Ruth Milkman and Laura Braslow, put out by the City University of New York’s Joseph S. Murphy Institute and its Center for Urban Research, found that more than 22 percent of NYC workers belonged to a union, nearly twice the national level. With its huge mass transit system, government-regulated rents, low-cost public university, large public hospital system, generous Medicaid program, and sprawling network of government and nonprofit social services, New York provides working families with a set of benefits and opportunities few cities can match. But scratch a little and things do not look so good. During the recession, the city had big job losses in relatively well-paid sectors, including government, construction, manufacturing, finance and insurance, and wholesale trade. The biggest gains since then have been in low-paid industries: restaurants, retail trade and home healthcare. 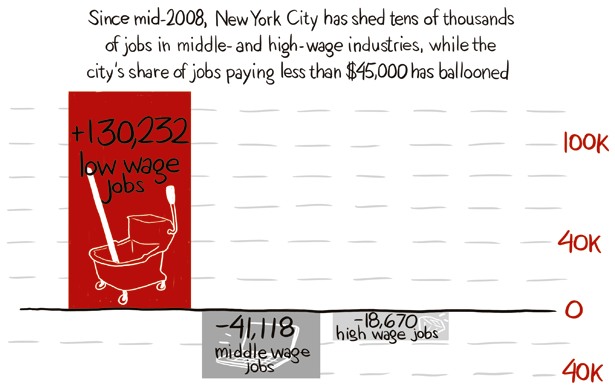 Between July 2008 and July 2012, New York City had a net loss of nearly 60,000 jobs paying $45,000 a year or more, while gaining more than 130,000 jobs paying less than $45,000 [see chart, page 18]. The changing mix contributed to a nearly 8 percent drop in real median wage earnings between 2008 and 2011. An analysis by Hofstra University economists Gregory DeFreitas and Bhaswati Sengupta suggests that many newly created jobs have gone to commuters, exacerbating the difficulty city dwellers face in getting good jobs. For residents of the five boroughs, the official unemployment rate in February was 9.1 percent, well over the national level of 7.7 percent. Though New York is festooned with displays of luxury, its median household income is below the national median and falling. In 2011, 21 percent of New Yorkers lived in poverty, compared with 16 percent nationally. Image: Susie Cagle. Source: Fiscal Policy Institute’s seasonal adjustment of CES employment data and QCEW 2011 annual average wage data from NYS DOL. Low wage industries are those whose annual average wage is below $45,000. Middle wage industries have annual wages of $45,000-$75,000. High wage industries are those whose annual average wage is above $75,000. Shrinking union power has contributed to the slip in living standards and public services. While union density in the city remains high by national standards, it has fallen by 13 percent since the mid-1980s, when more than 35 percent of New York workers carried a union card. All of the recent decline has been in the private sector, where now less than 13 percent of the workforce is unionized. Some of the membership drop came in industries like manufacturing, where total employment fell, but much of it occurred in sectors like wholesale and retail trade and leisure and hospitality, where employment has been rising. The recent strike by 8,800 school bus drivers and matrons exposed the weakness of organized labor in New York. Mayor Michael Bloomberg’s desire to lower the cost of transporting students by rebidding the city’s contracts with bus companies set off the conflict. Amalgamated Transit Union Local 1181 wanted the city to require the bidders to accept a provision it won after a three-month strike in 1979, mandating that new vendors hire the employees of the losing bidders according to seniority, thus providing its members with job security. The city refused, saying a recent court decision would make doing so illegal. In response, the workers called a strike, a rarity these days in a metropolis where walkouts were once so common that, in 1968, labor reporter A.H. Raskin dubbed it “Strike City” in a New York Times Magazine story. This time, however, the mayor refused to budge; bus companies began recruiting replacement workers; and the strikers’ health insurance ran out. After four weeks, the union threw in the towel, returning to work with only a fig leaf to cover its defeat: a pledge by the leading Democratic candidates likely to replace Bloomberg that, if elected, they would protect the job security, wages and benefits of the bus workers. In late March, the companies informed the employees—who still lack a contract—that they will be imposing a 7.5 percent pay cut, eliminating pay during the Christmas and Easter school breaks, and requiring larger contributions for health insurance. The striking bus union had some particular disadvantages. Linked to organized crime until federal prosecutors stepped in, it had weak ties to other unions and failed to build community or political support before the walkout. The lukewarm backing from organized labor suggests a larger problem. The big unions that dominate New York labor, like the building service workers (SEIU Local 32BJ), healthcare workers (1199SEIU), United Federation of Teachers and electrical workers (IBEW Local 3), have an unstated confidence that they can rely on their own power to defend themselves. The very success of organized labor in New York makes it act less like a movement than it does elsewhere. Vinny Alvarez, the president of the New York City Central Labor Council, thinks that situation is changing, as the big local unions—as large in membership and capacity as some national unions—“realize that as smaller unions get annihilated, in the end it will expose them.” The bus strike could be a wake-up call. In recent years, power has been draining out of even some of the strongest New York unions. In the construction, hotel and communications industries—longtime union strongholds—nonunion operations have carved out big niches. In the public sector, too, unions have been weakened, as Bloomberg has taken a hard line opposing pay boosts. One municipal union after another has decided to avoid open battle, hoping for a friendlier successor and a more hospitable fiscal environment. Every one of the city’s 152 union contracts has expired (though under state law their terms remain in effect until new agreements are reached). The stalling tactic—“recognition we don’t have anyone on the other side to negotiate with,” as Arthur Cheliotes, head of a local that represents thousands of city administrative workers, terms it—might ultimately pay off, but it seems unlikely that city employees will ever make up the losses they have suffered from frozen wages while living costs have kept rising. As unions wait out the clock, their members have become demobilized. With so few private sector unionists to ally with, the once mighty municipal unions are ill-prepared if some future mayor or governor decides to launch a Wisconsin-style attack on them. The revitalization of the New York labor movement requires organizing private sector workers, and lots of them. That’s a heavy lift. An effort by the Communications Workers of America to unionize Cablevision has been what Bob Master, a union official, called “a textbook example of how difficult it is to organize.” A year ago, nearly 300 technicians and dispatchers in Brooklyn—almost all African-American or Caribbean—voted to unionize, only to have the company spurn serious bargaining. In January, it fired twenty-two workers for requesting a meeting with managers. After seven weeks of pressure from the union, community groups and local politicians, Cablevision rehired the workers, but a contract is nowhere in sight. A few innovative efforts are under way, targeting low-wage workers in jobs that cannot be relocated. The Retail, Wholesale and Department Store Union (part of the United Food and Commercial Workers) won recognition votes last fall for workers at five car washes, an industry notorious for low wages, long hours, unsafe conditions, and violations of wage and hour laws [see Lizzy Ratner’s article on TheNation.com]. SEIU Local 32BJ, which already represents 15,000 security guards from Connecticut to Washington, DC, has been organizing low-paid security workers at New York–area airports. Fast Food Forward, backed by the national SEIU and community and civil rights groups, led a one-day walkout during the holiday season at Wendy’s and other restaurant chains, demanding higher pay and better conditions, and staged another in early April. The militancy and innovative tactics of these normally invisible workers have provided labor with a much-needed charge, but the resources involved and the gains so far have been modest. Any transformative effort—like a push to organize bank employees tied to a campaign against bank lending and fee practices, promoted by Stephen Lerner before he was forced out of the SEIU leadership—would require a much greater commitment of money and political clout. Ott thinks the greatest promise for reviving labor may lie with nontraditional worker organizations like the Taxi Workers Alliance, which represents nominally self-employed cabdrivers in their dealings with government regulatory agencies and the companies from whom they lease their cars; Domestic Workers United, an organization of Caribbean, Latin and African caregivers and housekeepers, which won a major victory in 2010 when the state legislature passed the Domestic Workers’ Bill of Rights, mandating overtime, vacation pay and protection against sexual harassment for workers previously uncovered by labor law; and the Restaurant Opportunities Center, which charged some high-profile restaurants, like Mario Batali’s Del Posto, with labor law violations and won. But as impressive as these well-publicized groups are, their gains have been limited and, except for the taxi workers, their dues-paying memberships small. Worker alliances, some traditional unions, community groups like Make the Road New York, the union-backed Working Families Party and the Faith Caucus of religious leaders have joined to pursue another strategy to improve life for low-wage workers: “living wage” laws that set minimal wage levels (above the general minimum wage) and mandate benefits for employees of companies and nonprofit agencies receiving government funds. A 2002 city ordinance, according to Stephanie Luce, a leading scholar of living-wage efforts, was one of the “most extensive” in the country, pushing up the wages of 50,000 home healthcare workers and thousands of others. But it has been harder going since then. A 2012 law intended to benefit workers at developments subsidized with public money was greatly whittled down. A proposed ordinance requiring employers to provide paid sick leave was bottled up for years by City Council president Christine Quinn, before she finally relented early this spring and agreed to allow a weakened version of the original proposal to come to a vote. Luce believes that living-wage coalitions have not been as successful in New York as they have in California because some powerful unions have cut their own deals with the city, dropping out of broader initiatives. In some respects, working-class New York is thriving. With more than 40 percent of the workforce foreign-born, it has a cultural vibrancy only occasionally noted in the mainstream media (except in reviews of ethnic restaurants), but evident to any casual visitor to immigrant neighborhoods. People still flock to New York from all over the world seeking economic opportunities and personal freedom. (At more than 8.3 million people, the city is as large as ever.) With the city’s streets extraordinarily safe, with municipal services under Bloomberg generally well run, if you own a home with an affordable mortgage or have a rent-regulated apartment, and if your children are lucky enough to go to schools that are not failing and you have managed to keep steady work at decent pay, you might well be better off than you were a dozen years ago. But for hundreds of thousands of working-class families with unsteady work, low wages, unaffordable housing, crummy schools and no union representation, New York City has failed miserably—a wealthy, self-congratulatory metropolis, whose pride of place rests on willful blindness. Robert W. Snyder reviewed Joshua Freeman’s Working-Class New York: Life and Labor Since World War II, a survey of the lives and conditions of the city’s working class. Read all of the articles in The Nation‘s special issue on New York City.